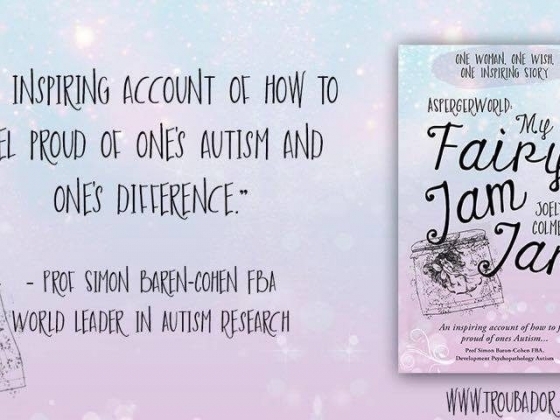 by multi Award Winning Autistic Autism Activist. My name is Joely Colmer, I was diagnosed at 2 years old with Autism. 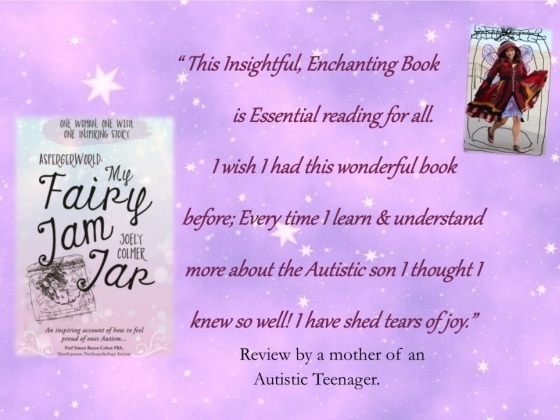 I am a passionate Multi National and World Award Winning Autism Activist, Motivational Speaker, Autism Trainer and Best Selling Author of new inspiring and educational resource book ‘AspergerWorld: My Fairy Jam Jar’… and I have a gift. My gift enables me to experience the rich, vibrant tapestry of life, in all its glorious detail, and have passions that empower me with great memory, empathy and intellect. You see, although my gift walks hand in hand with my greatest difficulties, challenging me every second of every day, it also embraces together with the very things I love most about myself. I am blessed to be empowered by my disability to have fascinations and specialist interests- mine have changed a lot over the years; once upon a time, I loved ancient history. I remembered every factoid I read, with reels of passion and inspiration; I even learnt to communicate with ancient Egyptian Hieroglyphics because I was partially deaf and couldn’t talk. When I found out about my Asperger’s, at the age of 13, I was overwhelmingly happy to finally belong, to understand myself, and my fascinations swiftly changed. You see, I always knew that I wanted to make a positive change in people lives, but I never knew how. Yet, everything suddenly clicked into place and made sense to me once I found out about my Asperger’s - I could use my disability to my advantage, to best enable me to help others with insight. Within months, my disability, my gift, became my specialist interest, and I learnt everything and anything about the various aspects of my disability, allowing me to achieve my dream of helping make a positive change-By writing my book and raising positive understanding of the hidden depths, hardships and quirks of the Autistic Spectrum. Once upon a time …. I was shadow of the woman I am today. As a teenager, I felt trapped, like a zombie; pained, numb, alien, misunderstood, and desperately trying to survive in a world of chaos; a world that seemed to be designed to make me fail. I was struggling in despair with the hardships of my disability, battling my way through Post Traumatic Stress Disorder and clawing my way through the darkness of depression. At 18, my life changed, by volunteering as an Activist at a local disability youth group, my negative shell fell away. Suddenly I was empowered by a community of understanding people, and enabled to realise my quirky gifts of my disability. By helping me make friends, enabling me to see positively, allowing me to gain valuable work experience and life skills, as well as develop an understanding of myself and helping me to make society more autism friendly… suddenly everything changed. Just like that, an inspiring sensation rushed through my mind, something that once seemed so far-fetched, and almost unimaginable … I became happy again. As part of my Autism, I have lesser known issues, such as extremely low Executive Function abilities. Executive function (EF) is a broad term that refers to the cognitive processes that help us regulate, control and manage our thoughts and actions. It includes (difficulty with) planning, working memory, attention, problem solving, verbal reasoning, inhibition, cognitive flexibility, initiation of actions and monitoring of actions. In other words, I find it hard to process information, initiate tasks and make connections that certain tasks need to be done. Most people on the autism spectrum have some degree of impaired executive function. Because executive function is such a complex concept, it can be hard to understand how it impacts our lives in practical ways. The biggest way my executive dis-function affects me is that I could look at the dirty dishes in the kitchen and not even make the connection that I need to clean them, because I’m too busy being unintentionally overwhelmed by sensory and information stimuli - it doesn’t leave room for outside information to enter my thoughts, to make me realise to do extra things- like chores. This is a daily occurrence with every chore or task that needs doing. These chores that need doing are mounting up, and I never seem to be able to physically realise I need to do them, or then initiate the task. Did I forget? Or was I just simply too overloaded and overwhelmed trying to cope with it all, that the new information to do chores just wasn’t sifting through- even with reminders? It’s a question I have been asking myself a lot lately. Am I at fault? Am I lazy? Stupid? Or do I simply need to understand myself better? The tasks on my reminders list such as “hoover” “clean bathroom” “do laundry” would take my friends or family an hour to finish them all. Simple and easy; a thoughtless chore. Yet these chores require great energy and thought for me. These errands can take me hours, if not, then most of the day to try and complete - and that doesn’t include the hardships I have initiating tasks, the routines I need to complete these tasks, the quality in which I do the task under pressure, and the time out required per task to prevent me from getting so overloaded that I can not continue. I become so utterly exhausted after trying to do chores or basic tasks, and often I’m asleep within minutes, as my pain, and the shutdowns of my capabilities takes its toll. It’s hard to come up for air, when the outside world is intent on smothering you, blaming you for your lack of oxygen. So, I often stay there until the next day, unable to physically move, replenishing my abilities, in the hope that, once I’m better, I’ll be capable of doing the chores I need to do- and hoping beyond hope that I’ll learn to realise that there’s a chore that needs doing, upon seeing it. My inability to properly plan ahead and complete daily tasks has hindered my life skills, independence, and personal growth all my life, but especially since I moved away from home. I live in a constant state of disorder. My poor organizational and cleaning skills have fractured my relationships, prevented me from thriving in my career or have a job, and in the process, it has destroyed my self-worth and self belief that I am worthy of my fiancé- who thankfully understands these difficulties of my disability and supports me endlessly. I tried various planners and egg timers, schedules. Nothing worked - because I could never account for how long time out would need to be and realistically how long tasks take me; with endless variables. What worse, is that no one seems to understand this hidden part of my disability… therefore I am always at fault. People seem to view disorganization and so called 'forgetfulness' as easily amendable, and never searched for the source of my struggles- that it wasn’t laziness or forgetfulness - I was simply too overwhelmed to realise the chores that needed doing and then lacked the problem solving and organisational skills to do the chores. Surviving in a society that is so dismissive of your needs and difficulties is brutal. All my life people have smiled at me and said “chores will get easier as you get older. I was like that too” I would try to suppress my bitter laugh- because I knew that they had no idea what it was like- how could they? Unless they survived in my world as I do? Even others with ASD may not understand - because we are all human- and disabled or not, we are all completely diverse- this is one of the many ways of how my disability affects me, and everyone is affected differently. The truth is I am older; I have matured into a grown adult - and it has not got any easier. It’s got a lot more complex - just like life as an adult. The words of such people impact me with a stinging ferocity, attacking me with soul wrenchingly cruel under tones, because I finally understood what they really meant- stop being selfish, Don’t be lazy, work harder. It can’t be that bad. Stop being negative. Don’t give up. Many of whom view my disarray as a sign of laziness, unintelligence, and selfishness. True to unintentional gaslighting due to peoples misunderstandings of my lived reality, after each attempt to bring structure to my life failed, it became harder not to see myself that way too. I was a failure, and I was wrong, simply for being myself. School was a minefield of chaos and misunderstandings, I have memories of wondering around not understanding what lesson I was in, where I was or what was happening next. This is due to my shutdowns, overloads, and severe lack of executive function, which made everything, even things that were planned in advance, a stressful and overload inducing change. Combine this with the awful learning environments, I would often fail and be unable to participate or understand class or home work-through no fault of my own- there was simply not enough time to process information and with my poor executive function and inability to problem solve or make basic connections, I just couldn’t keep up with my fellow students. It was a vicious circle, the more overloaded and stressed I was, the more shutdowns of my abilities I would have- the less teachers understood, and the less they attemtped to support me, the more stressed I got, and the worse my shutdowns became...and the worse the cycle would become. It was so bad that my doctor prescribed me every Friday off of school so I could recouperate my lost abilities by resting and therapy. This is because it was so counterproductive expecting me to go to school and learn, focus and achieve, when it was so impossible for me to do so whilst facing shutdowns and awful learning environments. Its hard to believe in any positives when the world is continuously trying to prove to you that you are wrong, and not worthy of understanding or support. Did you know that those on the Autistic Spectrum are more prone to trauma and mental health issues as a result? Due to my disability, and my obsession and need for everything to follow the ‘right’ routines and correct, justified behaviours and truth, anything outside of that is terrifying and wrong. Things like change in routine or overloads, or anything that feels wrong or unjustified, can result in a meltdown, or a shutdown of my physical, mental and emotional abilities (I lose my abilities to walk, talk and do basic life skills). Such a negative response from something that a lot of people think is ‘small’, means that any experience more stressful than that, naturally has bigger consequences. Just imagine what happens to our mental health when we are faced with bullying, or other severe injustices? To me, it makes sense that due to these complications of Autism, we become traumatised easier-and it’s no less a trauma. I have flashbacks of traumatic events multiple times every day. I have PTSD in the traditional sense, due to experiencing abuse, but my trauma is also reliving and unintentionally obsessing over negative in justices from throughout the day, and being completely unable to function with the injustice traumatising further when it doesn’t get fixed; leading to meltdowns, burnouts, shutdowns and trauma. My PTSD wakes me with nightmares, fills me with fear and hopelessness, and every single flashback is like re living the initial traumatic event. People support you at first, especially straight after the traumatic event, if they understand it to be a traumatic event, that is. However, they don’t always understand that every flashback is just as bad as the first event- no matter how much time has passed. The support vanishes, and suddenly judgements and gaslighting often begins. They tell you your flashbacks aren’t real and they devalue your lived experience by telling you are wrong for experiencing life the way you do – that its not possible. They can make you feel like you are wrong, or guilty or responsible for not getting better. They tell you to ‘get over it’, because ‘’its all in your head and you can control it’. This is gaslighting, and a form of emotional abuse. Gaslighting is ‘to manipulate someone phycological into doubting their own sanity or self’. Having Autism, I am exposed to unintentional gaslighting on a daily basis, from people, who often don’t wish me any harm, and sometimes, they’re even trying to help. Who here knows what gaslighting is? First of all to explain the concept of gaslighting, Autism is NOT a crisis or a tragedy-people’s lack of understanding and the way we are sometimes treated and spoken to, IS. We are disabled further by people, the way they treat or talk to us and our inaccessible learning environments-and gaslighting. We can be enabled to be the best we can be by people who nurture our interests and talents, who support us unconditionally and who make an effort to learn to understand us, as individual Human beings- every autistic person does not display the same. Like all humans, we are all diverse- and that is beautiful. I say this because, the biggest difficulty in my eyes with lack of understanding of autism is that it is incredibly harmful and further disabling- autistic people are often unintentionally gaslighted on a daily basis by most people around them-even those who don’t mean any harm and who are trying to help-parents, professionals, peers, colleagues and friends. The definition of Gaslighting is: ‘to psychologically manipulate someone into doubting their own sanity or self’. This is a form of abuse-no matter how unintentional. Gaslighting is an awful thing to endure and changes everything you thought you understood about yourself. All of these examples stem from lack of understanding and makes the problem to be the individual who has autism. These examples make the individual who has autism doubt themselves while questioning their lived experience and why they need to do things in certain ways-it’s a very negative harmful vicious circle. It slowly decreases any self value or confidence in themselves or abilities-thus disabling further. Gaslighting can lead to depression, lack of self understanding or confidence, and awful feelings of isolation and simmering self hatred- I know this, because like thousands of others who live with autism, I too, have also been unintentionally gaslighted for most of my life, by people, who simply don’t understand me, or the ways my autism and the outside world effects me. Due to lack of understanding, people can’t always perceive how something so unchallenging and normal to them can be so hard and complicated to others (and supposedly we, who have autism have poor theory of mind!). 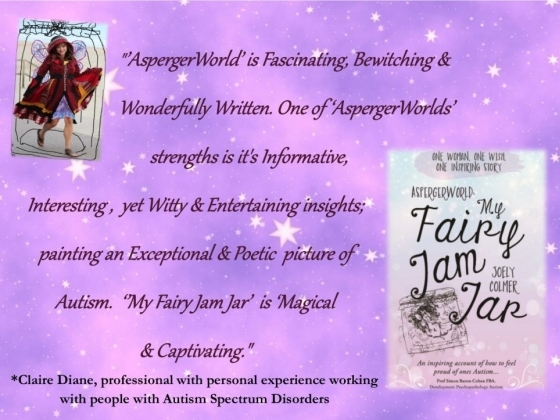 Welcome to “AspergerWorld : My Fairy Jam Jar”; a book penned from my rare professional and personal perspective. 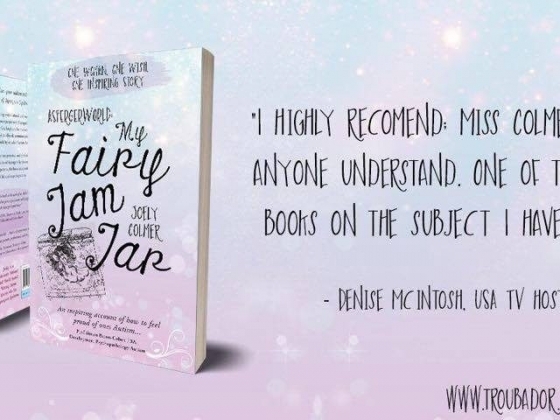 Here, I am a Fairy, living within a diverse, and rather quaint, ‘AspergerWorld Jam Jar’. I live here shaded from view, often overlooked; Witnessing the world from a different angle, deaf to certain language and happily powerless to escape. 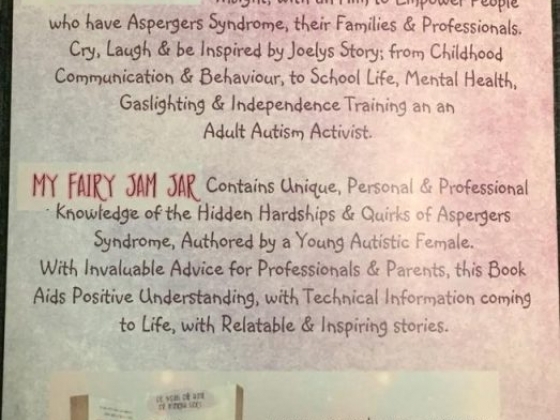 Within my Jam Jar, I am here embracing my disabled wings, to answer your wishes, and gift you with rare personal insights, to challenge negative perceptions. My book is available to buy online, using my website (if you wish for it to be signed and to receive it quicker), Troubador / Matador Online Bookshop, Waterstones Book Store, Amazon Books and Barnes and Nobles.